Our Health Office is staffed with nurses and student health assistants through a collaboration between AISD and Dell Children’s Hospital to provide health services for our students. Hello, Travis Heights Elementary School community. My name is Louie Riesch. 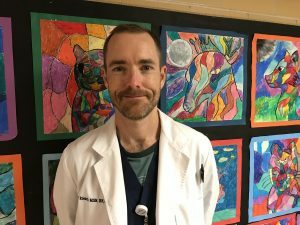 I have been a nurse since 2006 and a school nurse since January 2018. Before becoming a school nurse, I specialized in diabetes and endocrinology care in an advanced practice nursing role for almost 10 years. My nursing experience also includes 2 years working in an adult intensive care unit. In addition to my RN license, I am a certified diabetes educator (CDE) and I have a Master of Public Health degree as well as a Master of Science degree in nursing. My top areas of interest include health promotion, wellness, and health education. I am the father of a proud THES Thunderbird who inspired me to become a school nurse, and I am dedicated to furthering the well-being of all students in our community. Please stop by the health room and chat anytime. 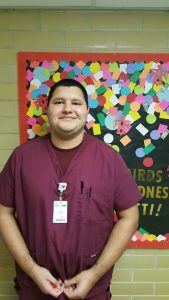 My name is Ray Regalado and I’m the School Health Assistant at Travis Heights Elementary. I was hired on by Student Health Services who is a part of SETON. I have been with the program since October 2013. I am a father of two beautiful children, Marciano age 2 and Camila 11 months . I’m a family centered person and love spending my downtime with my kids. I was honorably discharged from the United States Navy on September 2013. I served for 5 years as a corpsman (medic) and made rank HM3. My last duty station was 29 palms Marine Corps Air Ground Combat Center. I’m currently furthering my education in the healthcare field and aspire to one day become a registered nurse.